Loquiz PRO webpage is in english language. However Loquiz app is available in several languages and user can easily create personal language packs if needed. Together with available global languages this makes Loquiz work in any language you need. And it makes the app very flexible if you want to use your own personalized versions of already available languages. Menu -> Account settings -> PRO -> Available languages. Click in the languages box and mark the global languages you want to use. Chosen languages are now available on your account. NB! You need administrator or owner rights to do this. If language string is missing in any of the global languages then the fallback language for this string is English. You can not hide labels by not filling them in, English translation is displayed instead. If you want to change specific game’s language, you can do it individually for each game while creating or editing the game on “Configure” screen. Then all buttons, links and help text will be in this language inside the app. This does not translate tasks’ texts. Start screen’s language – it is possible to change also log in screen language. If you choose one language, it will be always shown on log in screen, even if the games are in different language. By default start screen language is in English, if you want to change it go to Menu > Account settings > App > Start screen language. Loquiz allows user to create any number of personalized languages based on any other language in the system. To create your own language, go to Menu -> Translations. Click NEW and fill in the English and Native name for new language. Icon is used in task list and dropdown box. Please use small image for this. Good place to get country flags is Country Flags. Base language is the language you base your new language on. If there is empty string in your new language, string from Base Language is displayed instead. So if you want to create your own personalized English language you do not have to translate everything. It is enough if you translate just the strings you want to change. Everything else comes from base language. Click Translations to start translating your new language. You will see each string in Base Language, the English explanation of where the string appears and then box to type in your text string. It is not always very clear in what form the specific string appears, so after translating a language please make sure to test it out. You only need to translate the strings you want to change vs. base language. 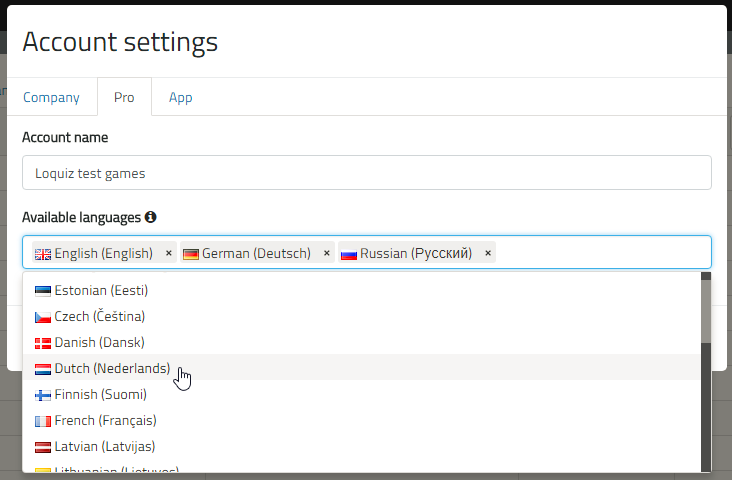 Go to Menu -> Account settings -> PRO, click on “Available Languages” box and add your newly created language if it is not already added. Go to Games -> Open Game -> Configure screen and choose the language you just created. Always test the new language to make sure the text fits the screen and translations make sense for the player. To test, just start a game with new language.